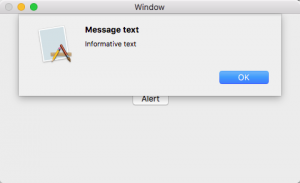 Most of the time if you want text to appear on your user interface, you just type it directly into your user interface, such as editing a text field or label. You can also create and edit text using the Attributes Inspector pane as well, but if you need to display large amounts of text, it’s often easier to create and edit that text in a separate file. 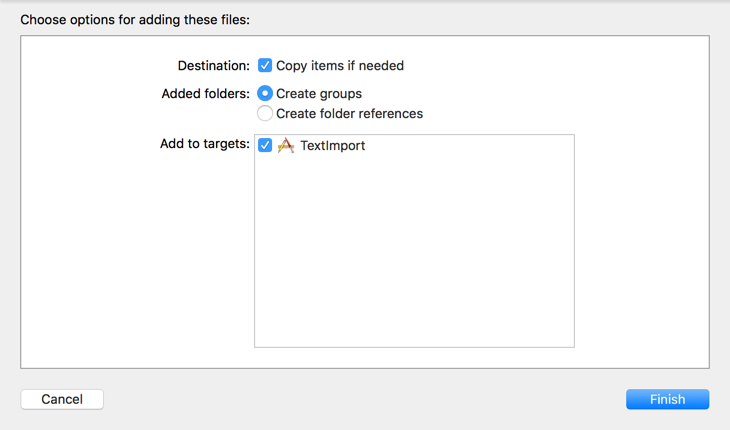 Once you create a separate text file (not stored in a word processor format like the Microsoft Word .docx file format), you can then drag and drop that text file into the Project navigator pane. When you drag and drop a file in the Project navigator pane, a window will appear to display options for adding a file. Make sure the “Copy items if needed” check box is selected. 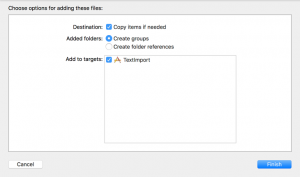 To retrieve a file, you must specify the filename and extension. If you stored text in a file called “Xcode.txt,” then the filename would be “Xcode” and the extension would be “txt”. // Xcode.txt file not found! 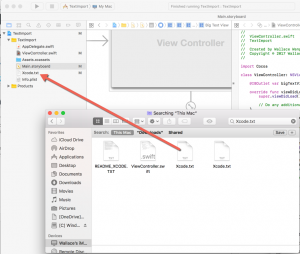 The above code would store the contents of the “Xcode.txt” file in the “contents” variable. Just remember that if your file were called “Data.asc” then the above code would replace “Xcode” with “Data” and “txt” with “asc”. In this code, newArray is defined as an array of String data types. Then the sorted() data gets stored in the newArray variable. Of course, you could just declare a new variable and store the sorted results in that new variable in one line. In the above example, sameArray is defined and given a value of sorted array data all in one line. With an array of structures, you can sort on individual fields. The TouchBar replaces the largely useless row of function keys on some of the MacBook Pro laptops. Since Apple recently updated their iWork office suite to take advantage of the TouchBar, it’s likely that the TouchBar will eventually find its way to other Macintosh models including on an external keyboard for the iMac, mac mini, and Mac Pro. Since the TouchBar will likely be another user interface accessory, it’s important to know how to write macOS programs that offer a TouchBar. If you’re writing macOS programs and don’t have a TouchBar, you can simply use the TouchBar Simulator. To use the TouchBar Simulator, open Xcode and choose Window > Show Touch Bar (or press Shift+Command+5). If you run any macOS program that supports the TouchBar, you’ll be able to see how those programs offer shortcuts on the simulated TouchBar. To add TouchBar support to your macOS programs, click on your Main.storyboard file to display your user interface, then open the Object Library window. 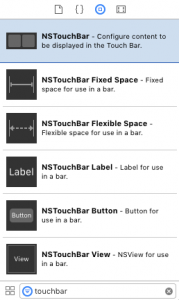 In the search field, type touchbar and the Object Library will display all the touch bar items you can add, including NSTouchBar, which is the touch bar itself. Drag the NSTouchBar from the object Library over the Window Controller in your storyboard. The TouchBar will appear directly beneath this Window Controller. Now you can drag other TouchBar items from the Object Library window on to the TouchBar such as NSTouchBar Slider or NSTouchBar Button. For this example, drag NSTouchBar Color Picker on to the TouchBar. Now the TouchBar needs its own class file, so choose File > New > File. 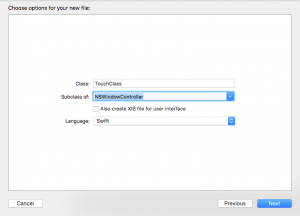 Click macOS and then click the Cocoa Class icon. Then click the Next button. A new window appears, asking for your class name and subclass. The name can be anything you want, such as TouchClass. 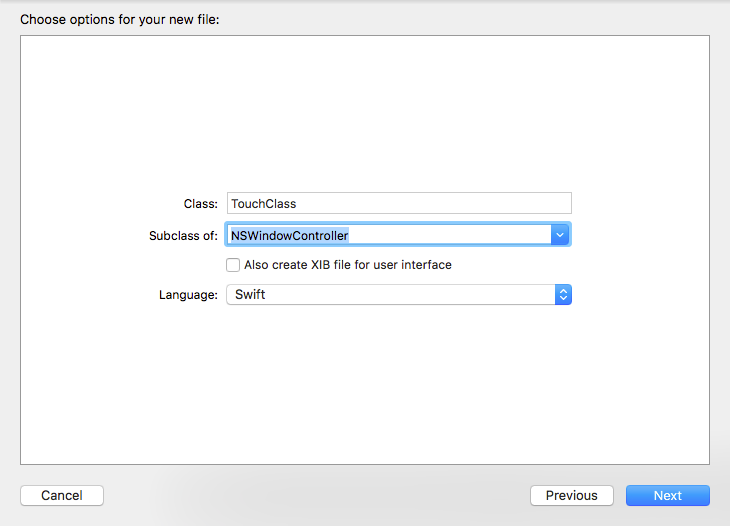 What’s far more important is that the Subclass is NSWindowController. Click the Next button and then click the Create button. This adds the TouchClass.swift file to the Navigator pane, Now the next step is to link this TouchClass.swift file to the TouchBar. 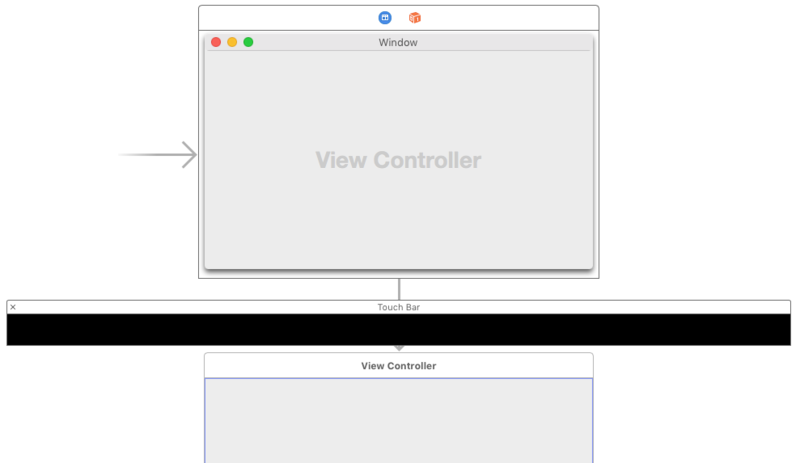 Click on Main.storyboard and click on the blue icon that appears in the top, middle of the Window Controller where you added the TouchBar. Choose View > Utilities > Show Identity Inspector. Click in the Class popup menu and choose TouchClass (or whatever name you chose for your class file). Once you’ve connected the TouchBar to a class file, choose View > Assistant Editor > Show Assistant Editor. 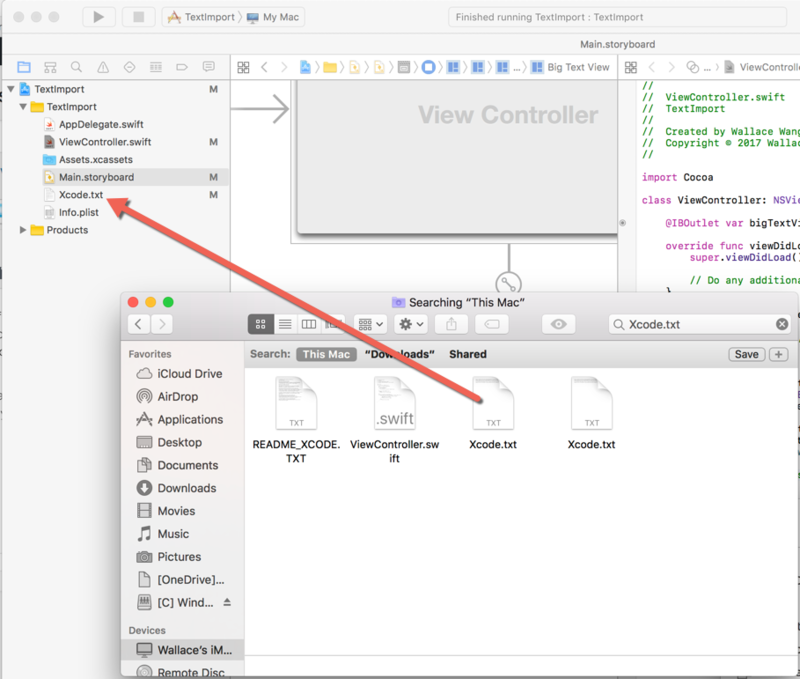 You want the assistant editor to display the TouchClass.swift file, but you may need to manually choose this TouchClass.swift file to make it appear in the assistant editor. Now with the TouchBar displaying a color picker, control-drag from the TouchBar color picker to the top of the TouchClass.swift file. @IBOutlet weak var colorIcon: NSColorPickerTouchBarItem! Choose Product > Run and you should see your program’s user interface, but probably not any sign of the simulated TouchBar. To display the TouchBar, go back into Xcode and choose Window > Show Touch Bar (or press Shift+Command+5). Go back to your TouchBar program and you should now see the simulated TouchBar visible. Click on the color picker on the TouchBar to display a range of colors. Each time you click on a color, the background of the window should display that color. The messageText property defines the bold text and the informativeText property defines the text that appears underneath. By using the NSAlert class, you an easily create and display dialogs as modal dialog boxes or as a sheet. You an also customize the number of buttons (up to three) and retrieve which button the user clicked on. By itself, this runAnimationGroup code does nothing. What you need to do is put your animation code within the first set of curly brackets and when that first animation completes, then you can run a second set of animation if you wish. Thea love code takes five seconds to rotate a label (lblMessage) 45 degrees. When it’s completed, it changes the label’s rotation back to 0 again. While this simple example shows how to rotate an item, the more important lesson is to see how the runAnimationGroup lets you combine two different types of animations where the second animation runs after the first animation completes. Any time you need to run two different types of animation back to back, use the runAnimationGroup structure. One of the reasons why artificial intelligence (AI) failed during the early days was because it required humans to program intelligence into a program. That meant exhaustively writing instructions for every possible outcome. One of the earliest and more limited successes of AI were expert systems that consisted of a series of if-then rules to mimic the thinking process of a human expert. The reason why expert systems worked was because they could tackle a narrow niche with limited and known variables. The reason why expert systems ultimately failed is because they couldn’t advance beyond narrow niches and required humans to exhaustively write if-then rules for every possibility. Even worse, when conditions changed, human programmers had to go back into the expert system to reprogram it and update it. This constantly meant consulting with a human expert and a human programmer, which made the expert system cumbersome to modify to the point where it wasn’t worth it at all. That’s all changed with machine learning. The whole idea behind machine learning is to let a program teach and update itself. Not only is this far faster, but it’s far more accurate allowing the program to adapt to changing conditions. If you’re interested in machine learning with Swift, download the open source, Swift AI library. This Swift AI library lets you create neural networks for both macOS and iOS. By incorporating machine learning in your apps, you can create more adaptive video games or smarter programs that can recognize handwriting or user behavior. Trying to create machine learning tools on your own in Swift is possible, but clumsy. It’s so much easier to use a tested machine learning framework instead, so that’s why you might want to experiment with Swift AI. As Swift gains popularity, it’s likely that others will create machine learning frameworks for Swift but until that day comes when we can choose from a variety of machine learning tools, Swift AI offers the best way to experiment with machine learning using Swift. At the very least, dig through the sample programs in the Swift AI library and give yourself a rudimentary understanding of how machine learning works and how to implement it in Swift. To download the Swift AI library for adding machine learning to iOS and macOS programs, click here. This function name (printGreeting) and parameter name (name) is much clearer as to the functions purpose, which is to take a name and print a greeting. Of course, this function could actually calculate a differential equation so it’s generally best to choose descriptive function and parameter names that actually describe the purpose of the function. The function call uses the printGreeting name and identifies the name (“Sam”). This is perfectly fine but in Swift, you have the option to use external parameter names. This means you can have two parameter names, an external and an internal parameter name. You may not want to do this for your own function declarations and calls, but you’ll find that many Swift API calls use external parameter names specifically to make function calls seem more like a sentence, typically using external parameter names of “in,”, “for”, and “with”. External parameter names simply help make code more readable although at the expense of also making function declarations more cumbersome to write. You can choose to use external parameter names or not, but whether you use them or ignore them, you’ll at least better understand why so many of Apple’s API functions look the way they do using external parameter names. This simply assigns the color blue (or whatever value you want to insert there such as red or yellow) to the background of the view layer. Of course, writing specific color values into code isn’t very efficient because if you want to change the color, you have to rewrite the code for a new color. A far better solution is to change the color using code and the simplest way to do that is to assign the backgroundColor of a view to a variable that represents a different color. One way to do this is to use the Color Panel (see this blog post covering the Color Panel). Chances are good you’ll need to manipulate numbers. However, when you want to display those numbers as a text string to display in a label or text field, you’ll need to convert that number into a string. stringHere = "This is a string = \(aDecimal)"
This code works exactly like the previous code so the “stringHere” variable holds the text string “This is a string = 2.3094”. Either method is fine, but there’s a third way to convert numbers into strings and that’s to use the NumberFormatter class. When rounding down to two decimal places, a number like 2.3094 would turn into 2.30. When rounding up to two decimal places, a number like 2.3094 would turn into 2.31.
stringHere = "This is a string = " + formatMe.string(from: aDecimal)! Copy and paste this code into a Swift playground to see how the NumberFormatter class works to convert a number into a string. While using the NumberFormatter class might seem clumsier, it does give you more control over the decimal places to display and how to round a number. For simple conversion of numbers to strings, it’s much simpler to use either the \( ) or String( ) methods, but if you need unique formatting, then use the NumberFormatter class instead.